Field is an A+ school! 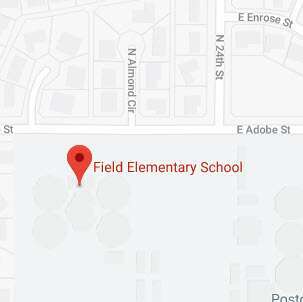 In April 2018, Eugene Field Elementary School was recognized as an A+ School of Excellence by the Arizona Educational Foundation. The A+ School of Excellence Program is a comprehensive school assessment program that celebrates outstanding schools and brings to light the positive stories and successes happening in public schools every day. Field submitted an extensive application that provided demographic information, descriptions of current programs and practices, documentation of community involvement, a profile of the school's leadership and commitment to excellence, equity and service. We had to demonstrate high achievement and/or significant improvement through assessment of data. A panel of award-winning principals visited Field and conducted observations and interviews to assess out school's programs. A+ School of Excellence winners are recognized for their superior ability to identify and meet the academic and non-academic needs of their student population. Battle of the Books winning team! Bus routes are available under the Parent tab. PTO meetings are held on the third Tuesday of every month at 4:00pm in the Media Center. Thanks to Kirt Noble for helping our school, by creating the garden for his Eagle Scout project. Field has a garden! Thanks to all those that helped! Ready for planting by our Special Ed classrooms. Fun sand art appeared in the kindergarten playground.